The mega project for the LNG production in the Arctic (part of Ural Federal District) goes into the next phase as the preparations for the second LNG plant are ongoing. 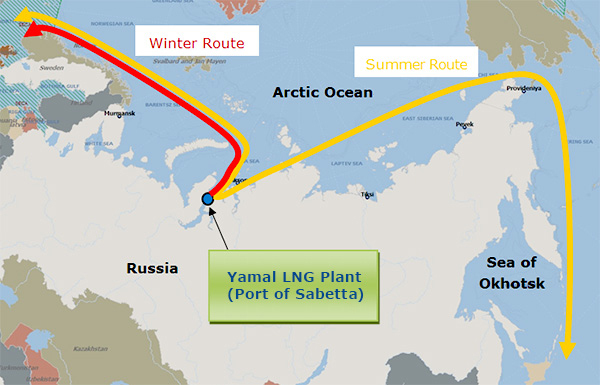 The first one called Yamal LNG was taken into operation in December 2017. The investments of over $25 billion were split between the Russian, French and Chinese shareholders – Novatek (50.1%), Total (20%), CNPC (20%) and Silk Road Fund (9.9%). The deliveries from Yamal LNG arrived already at the shores of US and UK grabbing media attention. In recent days Head of Novatek, Leonid Mikhelson, announced that the engineering and permitting phase for the second plant called Arctic LNG-2 will be finalized as soon as in November this year. The start of production is supposed to take place in 2023, with an annual output of over 10 million tons. Arctic LNG-2 will be likely implemented with Japanese partners. Novatek has signed a memorandum of understanding with Marubeni Corporation and Mitsui O.S.K. Lines Ltd. The final decisions are expected by the end of this year. According to forecasts, the volume of the Asian LNG market by 2030 will be 335 million tons per year. Be the first to comment on "Japanese companies to invest billions into LNG production in the Russian Arctic"